I have always enjoyed wrapping gifts with unexpected elements — using yarn instead of ribbon to decorate gifts is a nice way to wrap a Mother’s Day present. Gifts accented with yarn not only create beautiful and unique designs but also add a unique flair that is sure to impress your mom. It would be especially nice touch if you mom likes to knit or crochet. Here are some of my easy to create designs using different types of beautiful yarn. This gift design is easy to create. 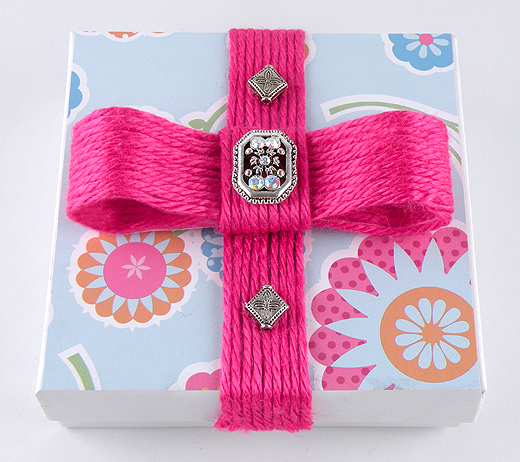 The lid of a jewelry box is decorated with scrapbooking paper and yarn to create a reusable box. 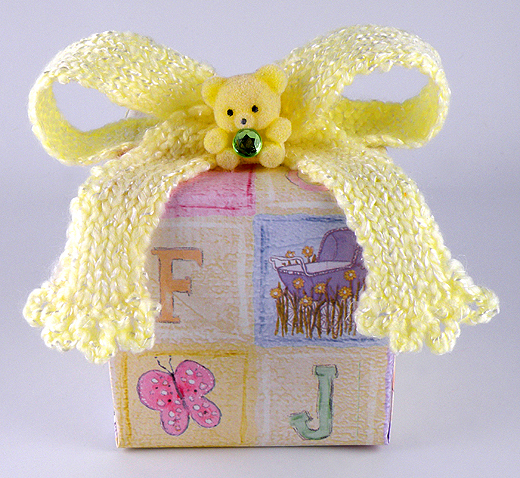 Adding a yarn bow to a gift will amaze people and leave them wondering how it was made. The secret is packing tape! Just add strands of yarn to the sticky side of packing tape to create a yarn ribbon. 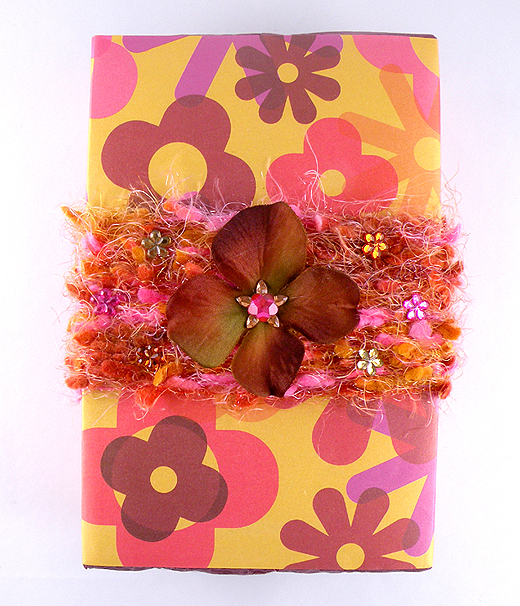 Here is a quick way to wrap a pretty gift with things you have on hand. A band of yarn wrapped around the box add interests to a present. This present was wrapping with reused tissue and a piece of coordinating scrapbooking paper. I attached a silk flower and rhinestones to accent the gift. This gift took less than 10 minutes to create. Look around your house, you will find all sorts of treasures you can used to adorn a gift. A knitted bow adds a heartwarming touch to a gift. It especially looks nice on a baby gift because of the softness baby yarn. This is a perfect project for a person who is just beginning to knit and also is a great use for leftover yarn from baby blankets, hats and booties. This would make a great gift for the expectant mother for Mother’s Day. 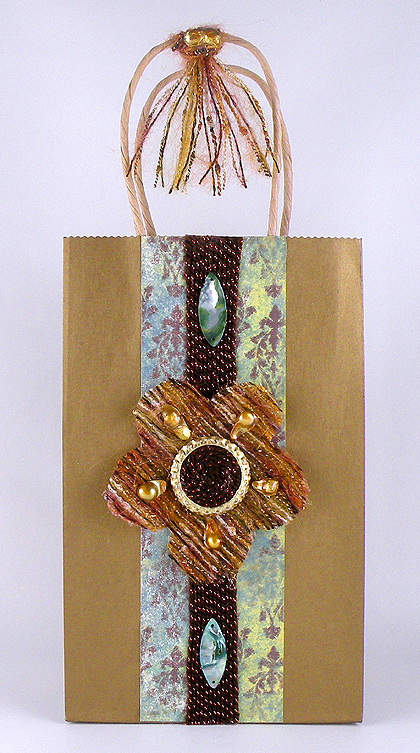 This inexpensive kraft bag is accented with different types of yarn to create an elegant and sophisticated gift bag. Household items such as a bottle cap and packing tape are layered with yarn to create the flower and yarn ribbon. 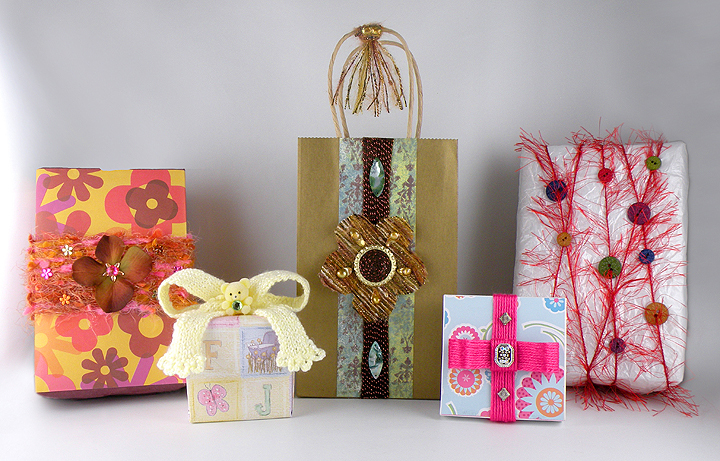 Use extra buttons to create a fun, whimsical gift wrap design. This gift is wrapped in reused double-layered crinkled tissue paper. The buttons are threaded onto textured yarn and wound around the box in a random pattern. The yarn is tied in a double knot on the back of the box to secure. You can also attach the buttons onto the gift with craft glue. This entry was posted in Gift Wrapping, gifts, Mother's Day, Recycle and tagged baby gift, expectant mother gift, extra button Gift wrap, gift bag, gift wrap, Gina Tepper, mother’s day gifts, packing tape, yarn, yarn gift wrap. Bookmark the permalink.